The future of Stargate is in question today, as SCI FI Channel has cancelled the long-running Stargate SG-1, Multichannel News reported today and a GateWorld source has confirmed. The news regrettably follows the airing of the show’s milestone two-hundredth episode on Friday. Stargate Atlantis, meanwhile, has been renewed for a fourth season, with the network hoping to see that the spin-off series can stand alone, according to a source. SG-1 has struggled in the ratings all summer, with the record-breaking tenth season premiering with a 1.4 household rating — down more than 20 percent from last season’s average. After a brief climb to a 1.6 in its second week, the show fell to a 1.3 in week four. Viewers and production personnel alike have blamed a number of factors for the show’s dramatically lower ratings, from SCI FI and Sony’s lack of promotion to the removal of anchor show Battlestar Galactica from the Friday night line-up, to new competition from such shows as USA’s hit Monk. Though also down significantly in the ratings this summer, Atlantis has consistently scored better than SG-1. “Studio executives are working to identify an alternative outlet for Stargate SG-1,” Multichannel News said, citing sources close to the production. 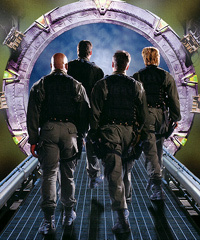 Stargate SG-1 premiered on Showtime in the United States in July, 1997, where it aired for five years before the pay cable network cancelled it. In 2002 MGM brokered a deal to continue production and move the show to SCI FI Channel, where it became the cable channel’s biggest hit and aired ten times per week in reruns. In addition to holding the record for the longest-running science fiction series ever produced in North America, the series is largely responsible for making SCI FI a Top 10 cable network. Though the writers intended to end the show several times, its larger, newfound audience on basic cable rejuvenated the series, extending its life far beyond the average science fiction series. Series lead Richard Dean Anderson left the show in 2004, to be replaced by Ben Browder and Beau Bridges when the show relaunched in a new creative direction in Season Nine. Ratings remained strong, though no longer at their historic peak. The show’s producers had even intended to rebrand the show Stargate Command, but SCI FI ultimately opted to stick with the established SG-1 name. Ironically, this is the first year since Season Four that plans were already in place, both creatively and in signed actor contracts, for another year. The show has lived on year-to-year since moving to SCI FI, with the writers forced to write a possible series finale every year — only to find the show renewed once again. Following the September 22 mid-season finale, SCI FI Channel intends to air the final 10 episodes of Stargate SG-1 beginning in March, 2007, a source confirmed to GateWorld. What is to come? Both the producers and Metro-Goldwyn-Mayer have expressed a desire to continue the hit franchise with not just Stargate Atlantis, but something new in the future — be it an SG-1 feature film or TV mini-series, or a third television show. The benefits of a simultaneous dual production in Vancouver, with two projects sharing producers, writers, and crew members, are tremendous for the studio. And Stargate is owner MGM’s flagship television property, having recently been compared to its venerable “James Bond” film franchise in importance. MGM has a great deal invested in an expanding field of licensing, official conventions, syndication, and international TV distribution. Notable is the upcoming MMORPG video game Stargate Worlds, perhaps the franchise’s largest licensed project to date, due out at the end of 2007. Meanwhile, Stargate Atlantis will have the chance to step out of the shadow of its parent show and stand on its own two feet. Though the foundational chapter of the Stargate saga draws to a close, hope remains for the future. An official announcement with additional details on the future of Stargate is expected this week. Stay with GateWorld for the very latest. Stargate SG-1 airs Fridays at 9 p.m. Eastern and Pacific on SCI FI Channel in the United States.